But some influential persons intervened and Daura was said to have allegedly â€œreached a dealâ€ with Maihaja and only asked him to refund the monies he collected as travel allowances for official trips he didnâ€™t embark on. 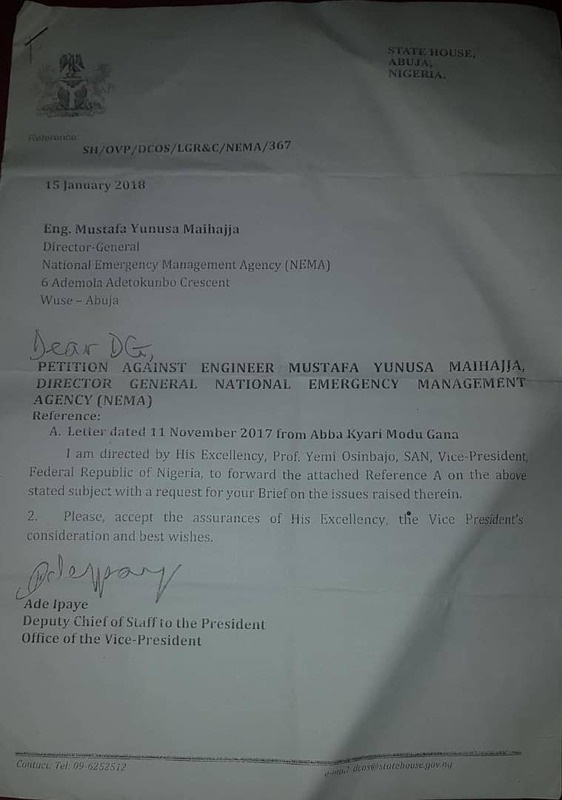 Gana, in the petition reportedly copied the Presidency, especially office of the Vice President, who doubles as the Chairman, Governing Council of NEMA, the nationâ€™s anti-graft agencies, leadership of the two houses of of the National Assembly and others, made allegations of fraudulent practices against the NEMA DG. On the 2017 devastating floods that affected 16 states of the federation, the petitioner alleged that upon the directive for the immediate release of N1.6 billion for the supply of relief support for victims, he said â€œthese might interest you that no item was procured and delivered to the statesâ€ affected by flood. â€œThe DG awarded a contract of N2.4 billion without following due process even though itâ€™s strictly above his approval limit and that of the Chairman governing council of the agency. â€œAnnexure II are copies of draft letters written to the Federal Executive Council and the BPP seeking certificate of no objection after an award letter was issued to the supplying company. Even though they are just draft documents, the DG went ahead to pay the company the sum of Three Hundred and Six Million (N360,000,000) and another sum of Nine Hundred and Nineteen Million (N919,000,000) with just invoices. â€œHe has been involved in the illegal approval of contracts that are constitutionally and according to the Agencyâ€™s Act exceeds his approval limit and that of the Chairman of the governing council. â€œThe contract award letters signed by the acting director Deparyment of Relief Services and Rehabilitation, a department that happens to be the consuming department of the items, annexure iii is the approval threshold of the Director General, annexure IV is a copy of NEMA Act, annexure v are copies of the contract award letters, payment vouchers and others illegal documents used for payment. â€œThe NEMA Abuja operations office was located at Wuye District before his resumption in office, on the experiation of the rent, the DG (Maihaja) said the amount paid (N7,000,000) seven million for two years was on the high side so he relocated the office to his brotherâ€™s house at Wuse Zone 2, Mombolo street at the cost of (N16,758,000) Sixteen Million Seven Hundred & Fifty Eight Thousand Naira for the same period of two years). â€œHe was scheduled to travel to Mexico for two weeks but he did not embark on the trip and he did not make refunds. â€œHe was scheduled for trip to Canada for two weeks, he collected the travel entitlement and spent two days, see his international passport for further detailsâ€.